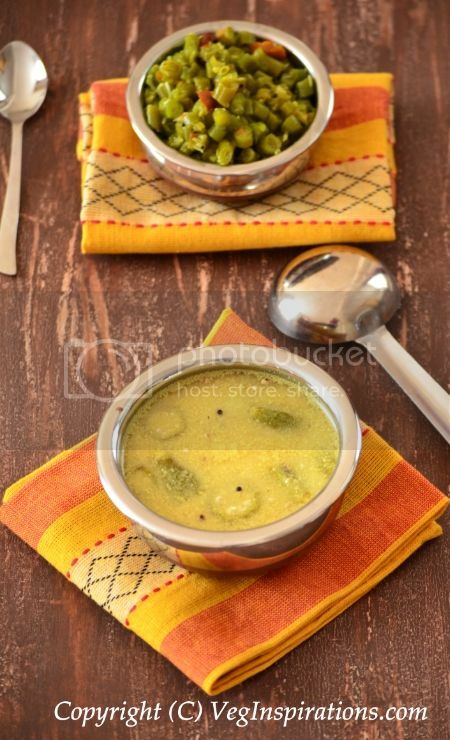 Mor kozhambu, a simple recipe that comes from south Indian cuisine, can be best described as a soupy form of curry, for lack of a better term to describe it. Mor is the Tamil (an Indian language) word for buttermilk and kozhambu is the tamil term for most curries that are made with a dhal or soup type consistency. Usually it is served on a bed of plain steamed rice with a dry stir fry curry on the side. This eggplant stir fry is my personal favorite curry in combination with mor kozhambu. Heat oil in a heavy bottomed medium pan, add chana dhal and roast on a low flame. When chana dhal begins to change color and become a little pinkish/ brownish, add fenugreek/methi seeds and stir for a few seconds. When methi seeds begin to brown, add green chilies, stir for a few seconds and remove from heat. Cool and grind this roasted lentils along with fresh/ frozen thawed coconut and water into a smooth paste and keep aside. In the same pan, heat oil, then add mustard seeds, when mustard seeds begin to splutter,add turmeric powder, stir once or twice, then add okra and stir until okra is cooked and soft. Add the ground mixture to it and allow it to heat, then add buttermilk and on a low heat, heat the mixture until it froths up. Remove from heat and allow to cool to room temperature before adding salt. This kozhambu should not be heated to a boiling point after the salt has been added, since the buttermilk will split. So if you are refrigerating the balance of this kozhambu you can warm it on low heat and serve warm with hot rice. just add the other vegetable, allow it to cook, adding a little water as required and then proceed with the rest of the recipe.